Kraft Foods is splitting the company in two. NEW YORK (CNNMoney) -- Kraft Foods Inc. announced Thursday that it will split into two different publicly traded companies. Kraft (KFT, Fortune 500) said that it will create a global snacks business with revenue of $32 billion, containing such brands as Oreo cookies, Trident gum and Cadbury chocolates. It will also create a North American grocery business with revenue of $16 billion, including such brands as Jell-O desserts, Oscar Mayer processed meats and Kraft macaroni and cheese. Shares of Kraft, a component of the Dow Jones industrial average, were up 3%. "We have built two strong, but distinct portfolios," said Kraft's CEO Irene Rosenfeld in a statement. "Our strategic actions have put us in a position to create two great companies -- each with the leadership, resources and strong market positions to realize their potential." Kraft also said it has completely absorbed Cadbury PLC into the company, 18 months after the merger with the British food and beverage company. The merger is one of the reasons why the company is choosing to split now. 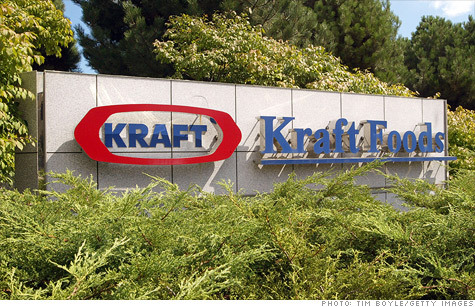 Kraft said it hopes to launch the two new companies before the end of 2012. Kraft also announced Thursday morning that its revenues beat expectations -- jumping 13% to $13.9 billion in the second quarter, compared to a year ago. A consensus of analysts surveyed by Thomson Reuters had forecast revenue of $13.1 billion. The company said revenues were driven by a 19% year-over-year increase in Europe, and a 23% surge in developing markets. These two markets account for more than half of all corporate revenue. The company also reported diluted earnings of 55 cents per share, up nearly 4% from a year-ago. Rich Silverman, spokesman for Dow Jones Indexes, said it's too early to tell whether Kraft will lose its status as a Dow Jones component as a result of the split. "It's a corporate action and it will take some time to come to fruition, if it comes to fruition," he said. "We will take action if appropriate." Silverman said the split still has to be approved by Kraft shareholders.